The price for the Real Property Database, which includes the USB thumb drive and the same data on a DVD is $336. the USB thumb drive and the same data on also on a DVD is $336. Locate new business for the construction, plumbing, electric, locksmith, landscaping, contractor, banking, mortgage and real estate fields. 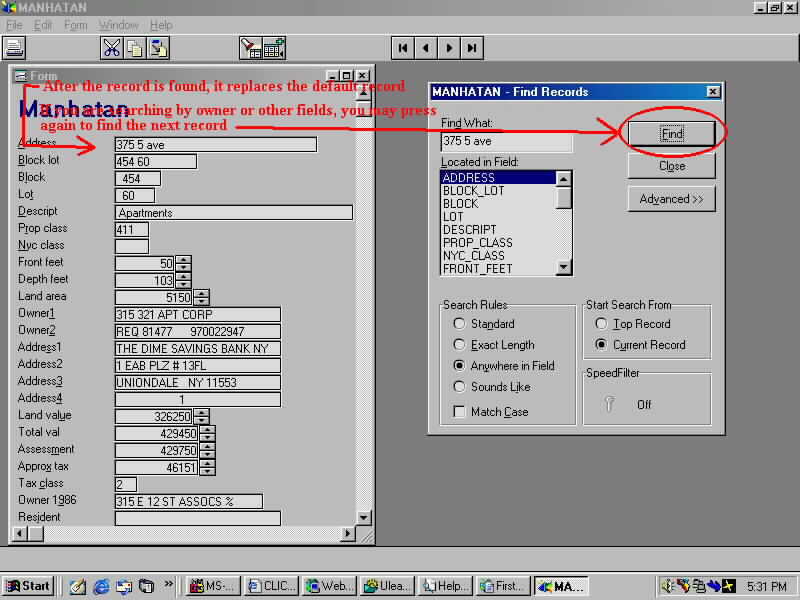 All products listed are designed to be used on a 100% PC compatible computer and are not designed to run on a Mac, though some Mac's may be able to read the data files which are contained on DBF format files. 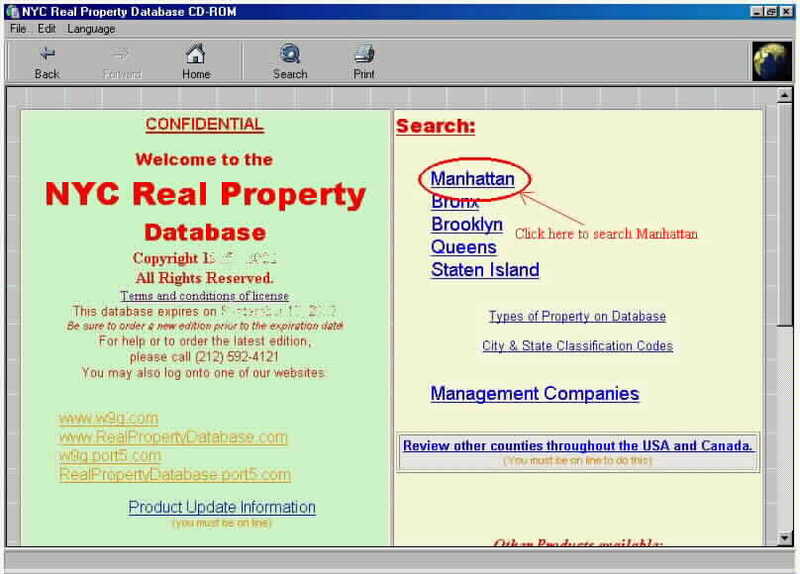 The Real Property Database is used by real estate brokers, developers, investors, insurance companies and other individuals to research and investigate properties New York. The Real Property Database is also helpful to companies who sell their products or services to building owners or the real estate industry. One of the many other advantages of of using the Real Property Database is that you can quickly search by product category, (ie. garages, warehouses, vacant lots, apartment buildings, etc. ), location, owner or by most other criteria. 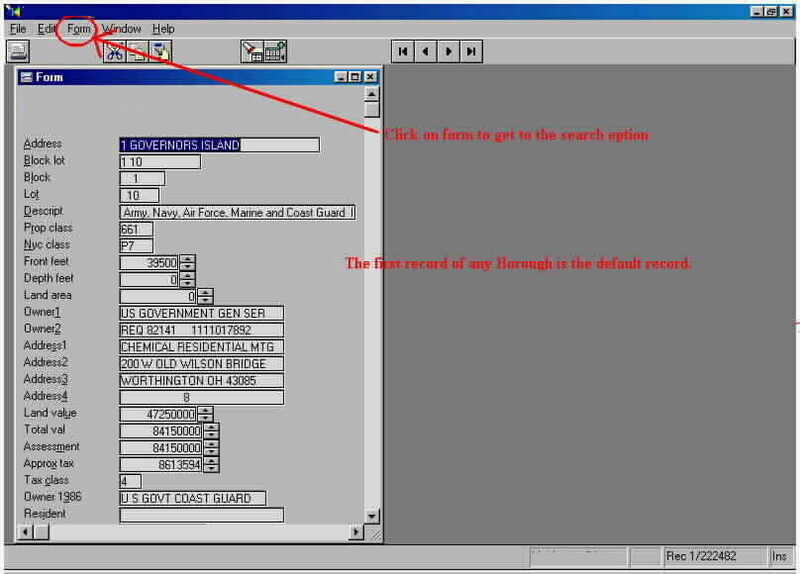 Further, you can use the data directly from the Real Property Database, or you can transfer the data and expand your existing records. Investors use the Real Property Database to assist them in finding properties to invest in. Includes every residential, commercial, condo and vacant land. 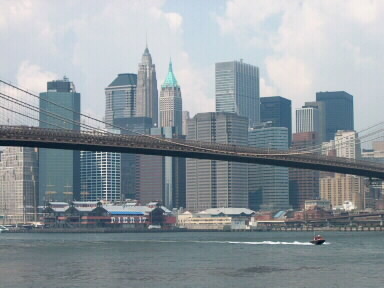 Find the owner and information on any property in New York City. Almost 1,000,000 Records at your finger tips! If printed, this would comprise of 21 books--1300 pages each. Condominiums, single and multi-family houses, apartment buildings, commercial buildings, office buildings, vacant lots...every property in New York City that has a block and lot number. Keys not included! Add your own keys! 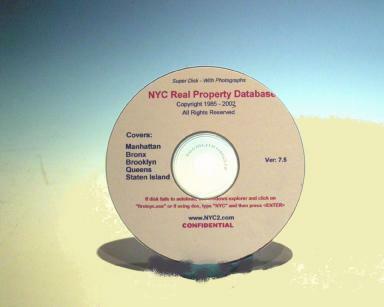 Order the Real Property Database USB thumb drive and DVD now! Please note: By purchasing/ordering this product, you agree that you have read the Terms of sale and agree to be bound by these terms. Thank you for your cooperation. 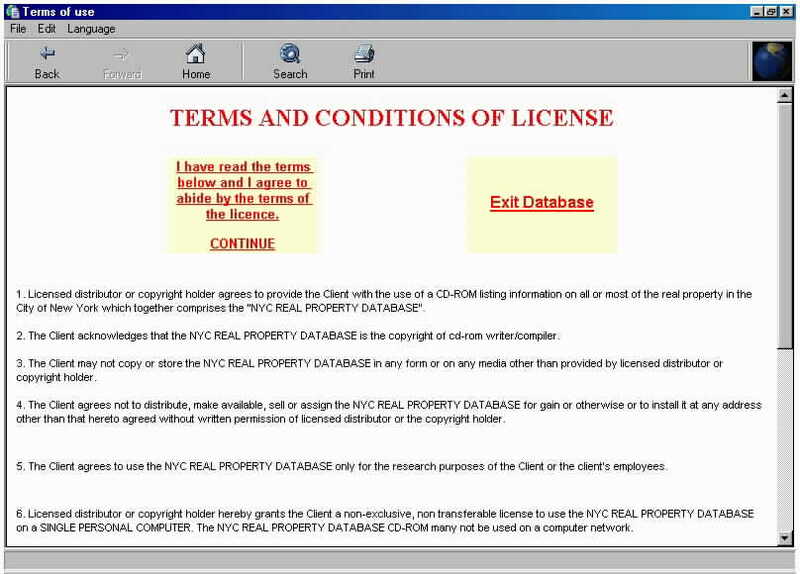 Price for the Real Property Database, which includes the USB thumb drive and the same data on a DVD is $336 for a one year license. The thumb drive is designed to be used on a PC. If you have a Macintosh, you will not be able to run the program, though you may be able to read the files in the .dbf format. 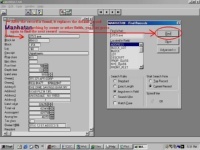 The program is self contained and runs without additional programs. Nevertheless, since the basic data is in two dbf files, many brokers import our data into their existing spread sheet or database programs and use our data as the basis for their contact list and mailing list. This can be a very useful feature, which may help you in sales. Now contains photographs of over 18,000 buildings in Manhattan south of 59 Street and historic block and lot maps (land book) covering Manhattan. USB thumb drive and the same data on a DVD is $336. 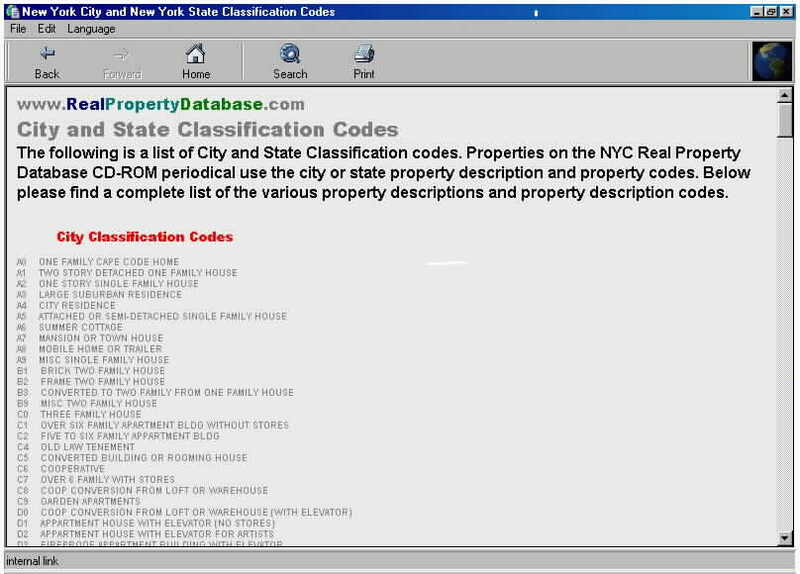 The Real Property Database USB key chain drive or the Real Property Database DVD contains information on almost every property in all five boroughs of NYC. This amounts to almost 1 million records. Almost every property in Manhattan, Bronx, Brooklyn, Queens and Staten Island! The information is so vast that if we were to print it in book form, we would need 21 books! This amazing database covers everything including commercial, residential, vacant lots, condominiums. It ever has air rights!! Even if you normally only work in one borough, you will find the information from the other boroughs very useful useful. One sale outside your normal business area would prove this. You can search the database by almost any field or combination of fields including by property address, owner name, block and lot, type of property or most other criteria. You can, for example, quickly view every property of a certain type or assessed value or every property owned by a certain company. 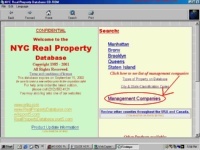 The Real Property Database USB key chain drive or the Real Property Database DVD also contains a property manager database of the leading property managers in NYC. 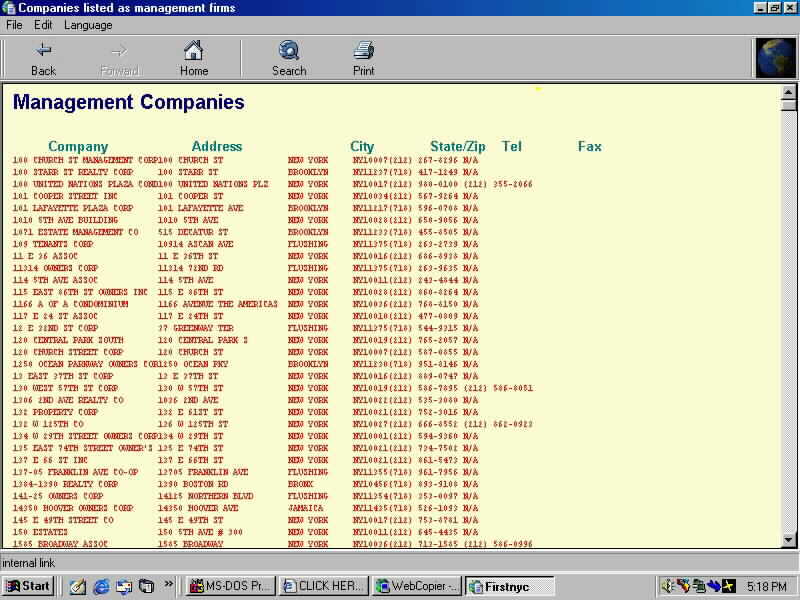 Presently, this consists of almost 3,000 property management companies. 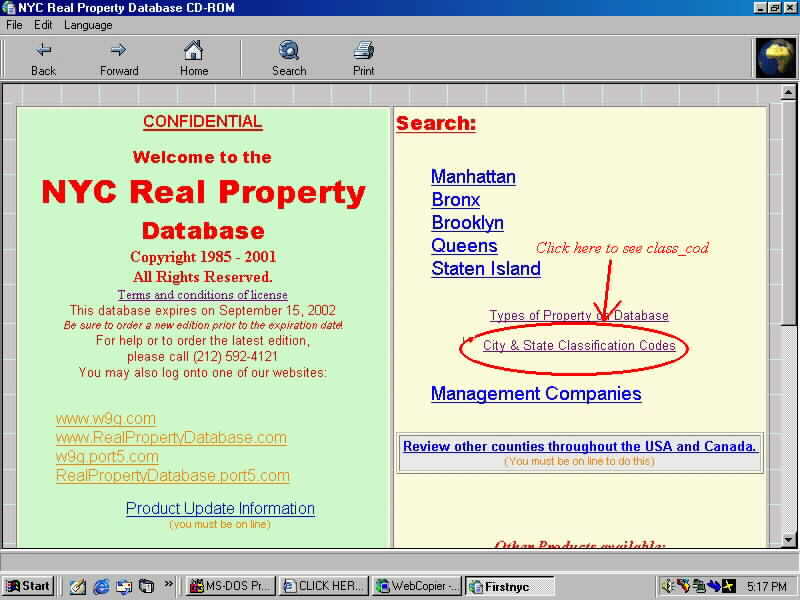 Some companies charge over $1,000 for property management databases alone, yet this is included as part of the NYC Real Property Database. 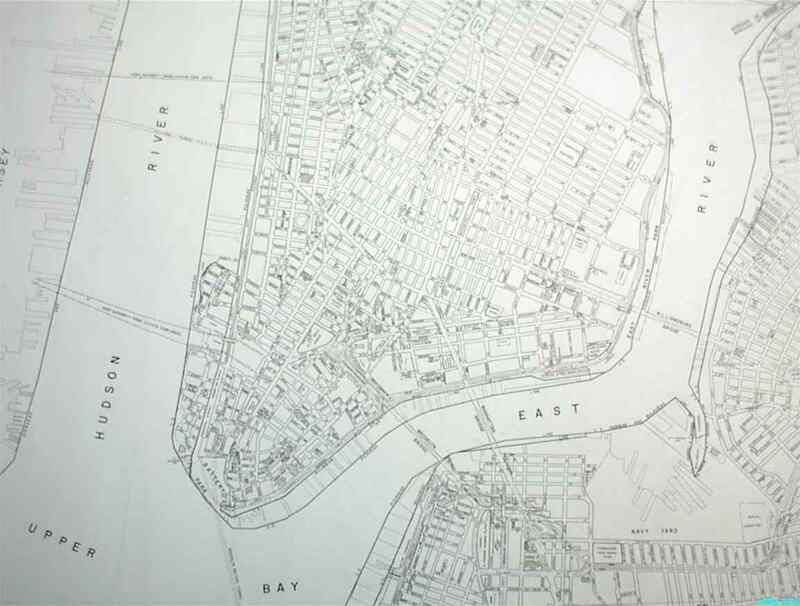 Historic block and lot maps (land book) of Manhattan. Besides all containing information on every property in New York City, the cd also contains various other programs and information that we developed for the real estate industry. The Real Property Database USB key chain drive or the Real Property Database DVD is the choice of most real estate brokers and sales people, land owners, investors, lawyers and anyone interested in buying real estate in New York City. The New York City Real Property Database CD-ROM is also widely used by electricians, plumbers, contractors, welders, builders, gardeners, window companies, heating companies and companies which provide services or products to landlords. Runs under windows. 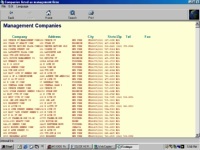 All products listed are designed to be used on a 100% PC compatible computer and are not designed to run on a Mac, though some Mac's may be able to read the data files which are contained on DBF format files. Researching special products, buildings, property, mortgages and other criteria. Creating Video and still renderings for developers and principals. Creating websites that convey your ideas and sells the product. Description of what the property is being used for (vacant lot, office building, condominium, apartment building and so on). For a list of descriptions, please press here. City or State classification code. 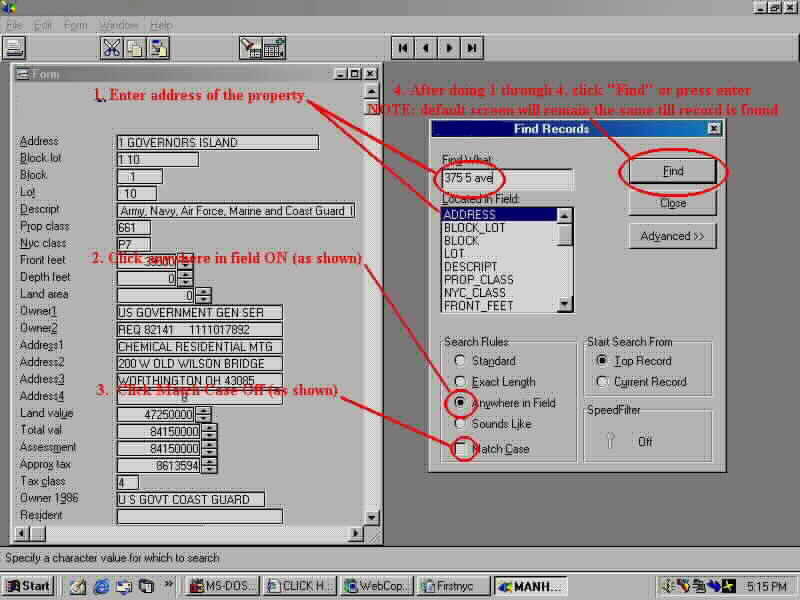 For a list of various codes found on the cd, please press here. Width and depth of the land is provided (for example 25 feet by 100 feet). 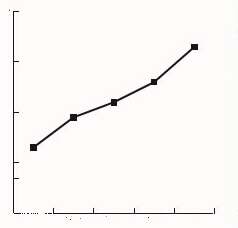 Indicates if the property is irregular in size. 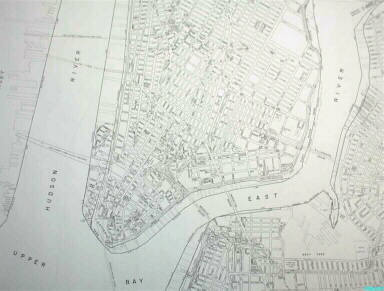 Besides the current property owner, the property owner in 1986 is also provided for most properties in Manhattan and certain properties in Brooklyn and Queens. If the same owner has owned the property for many years, they may be more likely to be interested in selling or refinancing. Type of business operating on some of the properties. ichmond, Westchester, Rockland, Long Island How to Buy a Home in New York City. How to buy a low cost condo or condominium in NYC. How to buy a house in NYC. How to buy vacant land in New York. How to transfer a property in NY. NYC list of property owners. 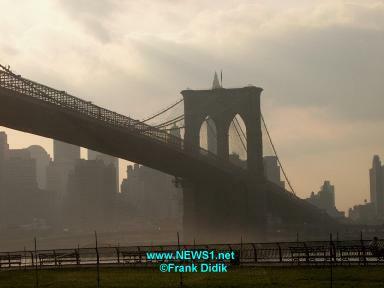 Real Estate Brokers in New York City. 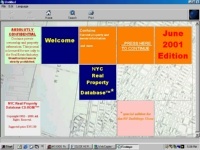 Complete directory of buildings in New York.